Richard “Rick” Veitch is an American comic book artist and writer who has worked in mainstream, underground, and alternative comics. 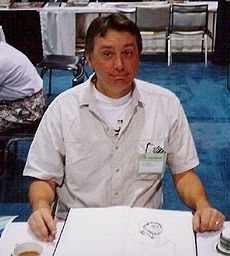 Veitch turned to the alternative comics field, where the success of Teenage Mutant Ninja Turtles had provided the impetus for a black-and-white independent comics boom. After doing a Ninja Turtles storyline for Mirage, The River, he began creating his own titles again, published by the Mirage spin-off Tundra.